Doesn’t this fantastic scene by Chris Maddison instantly make you hear the melancholy french horn solo from Binary Sunset (aka: The Force Theme by John Williams) in your head? With very few pieces and a limited color palette, Chris has perfectly captured the emotion of this iconic scene from Star Wars: A New Hope. I love the clean lines of the sand dunes and two-toned sky. 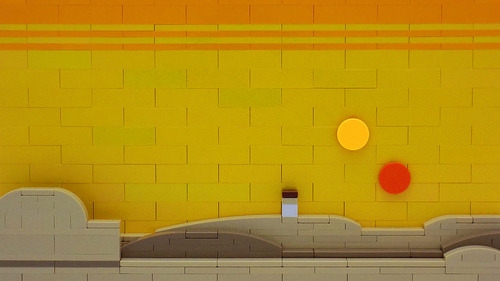 And of course, the double suns of Tatooine and the tiny Luke Skywalker are perfect.